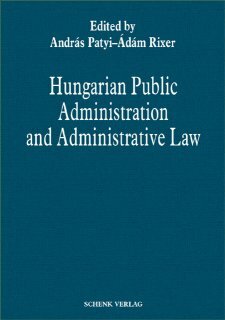 This volume, entitled Hungarian Public Administration and Administrative Law, serves to fill a long-standing void in the history of Hungarian administrative science, attempting to offer a complete introduction to Hungarian public administration in the English language, focusing upon each of its relevant aspects, such as the traditional characteristics of Hungarian public policy, the constitutional basis of public administration, organization and personnel, as well as the characteristics of administrative science. This volume has been written with non-Hungarian readers in mind, in order to suit their special needs. Thus, the discussion of each topic goes beyond the traditional, descriptive presentation of the subject matter, offering references to relevant literature in foreign languages, as well. This volume is the joint work of the L?rincz Lajos Public Law Research Group of the Károli Gáspár University of the Reformed Church in Hungary and the National University of Public Service. 6. The Future, as an important factor affecting public administration. organ, meaning that either the county system or the NUTS II regional system does not serve as territorial framework of the operation.